Romackcrane, is a leading company in lifting businesses that offers a complete range of advanced lifting solutions to many different industries worldwide. Specialized in cranes designing, manufacturing, sales, installation and maintenance service, Romackcrane is committed to providing you with lifting equipment and services that increase the value and effectiveness of your business. 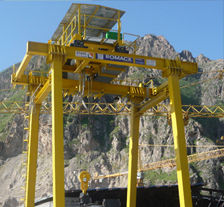 Romackcrane, is a leading company in lifting businesses that offers a complete range of advanced lifting solutions to many different industries Middle East. Specialized in cranes designing, manufacturing, sales, installation and maintenance service, Romackcrane is committed to providing you with lifting equipment and services that increase the value and effectiveness of your business. With two factories, we ensure a no-delay-service in cranes' fabrication. Reliability facilities, such as CNC flame cutting, Plasma cutting, Girder Boxing Line, Automatic Welding System, Sand Blasting Line, and advanced detecting device, testing equipment, laser measuring device, etc., are operated for excellent cranes. With around 2 decades of experience, Romackcrane always gives most emphasis to reach perfection, any of either minuteness welding line or negligible dimension will be not allowed in our factory. Space saving design, smaller wheel load, maintenance-free and high duty, galvanized high stress steel wire rope, adjust-free disc brake, programming limits, harden gear, inverter control, massive drum, heavy duty motor, etc., we are gathering all in one delivery on basis of successful cooperation with SWF Krantechnik. Being authorized agent of FELS (France), HADEF (GERMANY), STAHL CraneSystems (GERMANY), SWF Krantechnik (Germany), SM Schienentechnik (GERMANY), Diepa (GERMANY), Street (UK), Gantrail (UK) & Forjas Irisar (SPAIN), helps you to make sure of having the possible options for your business. Our cranes meet with your requirements, and secure your moving.